I love Creole food! Can you tell? 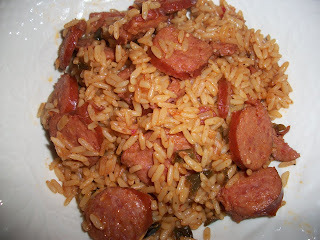 Here is an easy recipe for jambalaya. You can add ham, chicken, and shrimp as well. I just wanted sausage. It turned out great! I'll be sure to make it again. Melt butter in large stock pot. Saute onion, green pepper, celery and garlic until tender, being careful not to burn the garlic. Add tomato paste and cook to brown slightly, stirring constantly. Stir in bay leaves, Creole seasoning blend and Worcestershire sauce. Pour into a large roasting pan. Squeeze tomatoes to break up into pieces, and add to mixture in pan. Stir in juice from tomatoes, chicken stock, sausage, and rice. Mix well. Cover tightly with aluminum foil.